THE LEAVES OF YOUTH— A new collection of original poems. Scroll past the Update for the PayPal Buy Now button and details on the book. 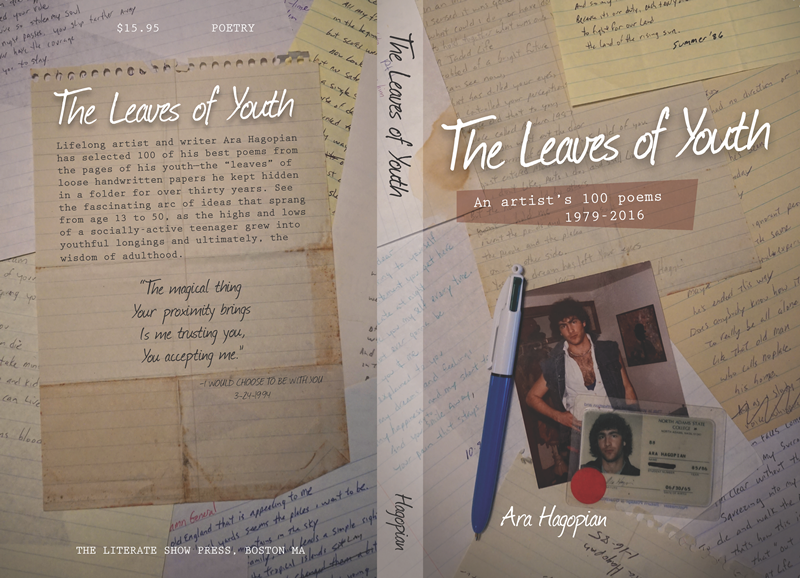 Lifelong artist and writer Ara Hagopian has selected 100 of his best poems from the pages of his youth—the “leaves” of loose handwritten papers he kept hidden in an old briefcase for over thirty years. See the fascinating arc of ideas that sprang from age 13 to 50, as the highs and lows of a socially-active teenager grew into youthful longings and ultimately, the wisdom of adulthood. Genre: Original poetry, with several presented as historical stories. Length: 100 poems, 30k words, 277 pages. Price: $15.95 with free continental US domestic shipping (MA sales tax where applicable). International price is $20.95 delivered. A short analysis of the poem “Maybe” is here. THE LEAVES OF YOUTH by Ara Hagopian. READ ABOUT: My first poetry reading, which was held May 5th, 2017! TO COME: Reader reviews, special photographs, and more! Bookmark this page and visit often. Hello readers, Ara here. Four days prior to publication, I came across this old letter from the Wakefield Superintendent of Schools. Note that Dr. Maio made three references to my poetry. When I asked for his recommendation, I must have given him the three poems I’d written through 1982. This letter is reproduced in the book, with permission. BELOW: In September 2016 LEAVES OF YOUTH art director Marie Sheridan photographed the book’s front and back cover. We spread the source poems on a table, along with a 1985 photo and my 1986 college ID– complete with a red dot, signifying I wasn’t of drinking age. Also in the arrangement was a 4-click pen, identical to the one I used in the early days. For the back cover, Marie wanted a vintage blank page, suitable for her layout later. For this look, we turned over the old steno sheet that the poem “Modern 1987” was written on. It provided the backdrop we needed. The pages were arranged to show the variety I’d used back in the day. We wanted to illustrate the old creases, stains and general aging of the papers. BELOW: Many of the book’s poems have images that served as inspiration. While no images appear in the book, a few are posted below. Read the poem and take a look at the associated picture. THE DREAMING SEA. Refer to page 240. BELOW: THE FOOTPRINT. Refer to page 231. BELOW: IN AND OUT OF SIGHT. Refer to page 243. BELOW: SHARE. Refer to page 148. BELOW: THE RAIN THAT DARED FLY BACK TO THE SKY. Refer to page 224. BELOW: BOY SOLDIERS. Refer to page 232. BELOW: I FOUGHT THE BULLY. Refer to page 248. BELOW: REMEMBERING ANNE. Refer to page 89. This entry was posted in Book, Fiction, History, North Adams State College and tagged poetry. Bookmark the permalink.